Below is our map of villa locations. 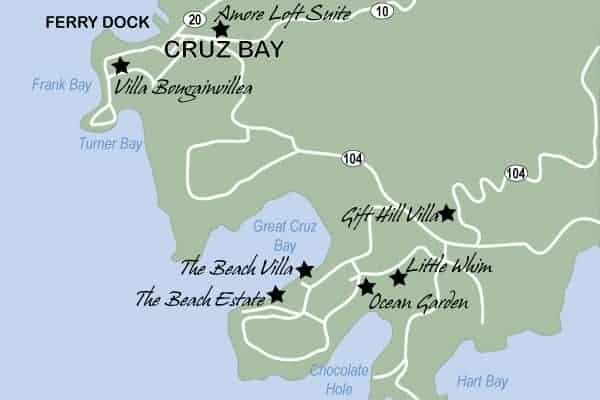 Scroll down further to see our villas on Google Maps. The Beach Villa – Located along the water on Great Cruz Bay. The Beach Estate – Located a little further out along the point than The Beach Villa. Ocean Garden – Located overlooking Chocolate Hole. Amore Loft Suite – Located in the heart of Cruz Bay. Amore Loft Apartment – Located in the heart of Cruz Bay. Amore Loft Studio – Located in the heart of Cruz Bay. Click on our villa placemarks in the Google Map below to view the exact locations of our St. John villas. You can also click on the link “View Larger Map” (below the map) to go to a larger Google Maps page. 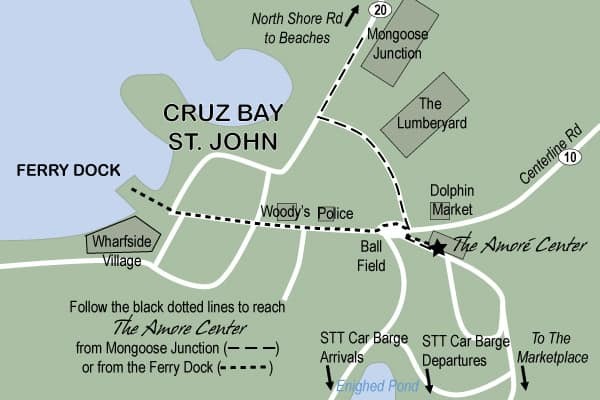 Both our pottery studio and our concierge services are all run out of our location at The Amoré Center – a short walk from either Mongoose Junction or the Ferry Dock.